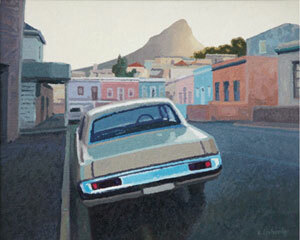 ‘Encounters’, a solo exhibition of oil paintings by Ben Coutouvidis was hosted from 24 May to 9 June 2007. Coutouvidis continues his kaleidoscopic exploration of the South African landscape, focussing on transmutations of water as visual metaphor for various emotional states. The title ‘Encounters’ is an acknowledgement of the dynamic interrelationship between artist and subject as a prerequisite for the pursuit of the real. Paintings portray scenes from Namibia, the Orange River, the Karoo and Cape Town in which degrees of homeness and belonging or foreignness and exclusion are evaluated.